Business and Life Coaching are offerings in my suite of services. I work mostly with Process Professionals (either internal within organizations and/or with external solo practices) and also progressive business owners and managers of various sorts. And I use a whole range of left-brain and right-brain approaches with my clients. Having coached for the last 15 years, I’ve gotten VERY comfortable with clients entering coaching with various degrees of dissatisfaction, discomfort and pain. So comfortable in fact, that I named the first step of my SHIFT-IT System® after it: Satisfaction Interrupted. And, through my Visual Coach Certification, I guide coaches, therapists, counselors and other helping professionals who work with individuals to get comfy with this initial dissatisfaction too. To recognize the inherent riches that lay on the other side of the pain just waiting to be uncovered and polished to a bright sheen. Entering a coaching alliance with a chosen coach can be vulnerable. 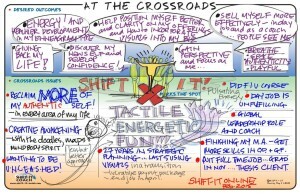 You are ‘at a crossroads’ and have taken the courageous step of admitting that something, or multiple things, are currently out of whack and have sought assistance to SHIFT-IT. 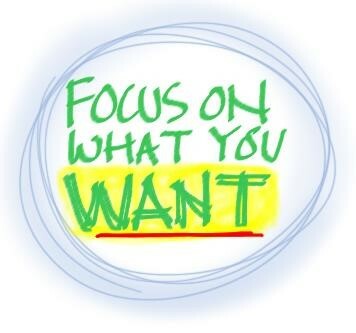 With Visual Coaching this is taken even a step further, as one’s thoughts and feelings are LITERALLY made tangible and visible! And stare back at you demanding your acknowledgment rather than bypass. I have great compassion for this vulnerability, having stood at various crossroads in my own life, and having been in the caldron of SHIFT-IT many, many times. And my own clients have taught me (as well as the clients of the coaches in our program) just how resilient the human spirit is and how remarkable dissatisfaction can be in improving things, if we learn to effectively harness its massive energy rather than be pummeled by it. Human beings have remarkable sensory abilities. And, if we don’t recognize the softer, more subtle signals when they first present … the volume is steadily turned up until we do take notice. Some people are finely attuned to emotional and other signs around them and it doesn’t take much for them to note a change in their status quo and react with appropriate action. Others … well, we take a little longer, or our situations are more complicated, and sometimes have to be hit with a two by four to finally get going in making change! Dissatisfaction and pain aren’t fun to be in. And, it can be dangerous for your emotional and physical health to stay in them for prolonged periods of time. However they can serve a very useful purpose beyond just alerting us that we are hurting … they can point us in the direction of what might possibly feel better. I personally think that pain and the breakthrough it can cause are spiral effects in our life. We go through a pain-breakthrough-pain cycle constantly and this spiral path is the way that things evolve, individually and collectively. That is why I’ve chosen the spiral arrow as our logo. It can help the intensity of your change process to realize that this spiral effect is a natural and inevitable pattern. What goes up must go down, and then back up again! The downs can hurt, however often turn out to be the ‘bouncing off place’ for something much better … if one can just hold steady through that journey! 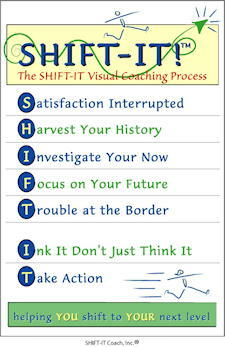 Visioning, as important as it is, is only one aspect of SHIFT-IT: alignment of energy and action are equally important too. One has to often do important ‘inner work’ to align beliefs and feelings to what is desired. And define and TAKE consistent action towards the Vision too. All three operate in a very powerful one-two-three engine. So, if you are standing on a current crossroads, take heart that you are in good company, we all go through poignant periods at various important junctures in our lives. Be gentle with yourself. And use your dissatisfaction and pain as a motivator to create better feeling circumstances for yourself. It will take aligned inner and outer work to create your SHIFT. And, the work will be well worth it when you are eventually standing in your stabilized future. Whew!